Growing up in Pennsylvania, Dr. Michael “Mickey” O’Donovan, DC, had always known that he wanted to pursue a career as a healthcare professional. While pursuing a bachelor’s degree in biology at Susquehanna University, he took an interest in physical medicine and rehabilitation, viewing the ability to help a patient recover from injury and heal in the least-invasive way possible (without the use of prescription medication and surgery) as something truly special. It wasn’t until his girlfriend at the time (now wife) Danielle was involved in two separate motor vehicle accidents that Dr. O’Donovan, DC, was turned on to chiropractic. Dr. O’Donovan, DC chose to attend Palmer College of Chiropractic’s Florida campus where he participated in various clubs and intramural sports. He was also elected to the Executive Council for the school’s Campus Guide Organization, a group of students who volunteer their time to show prospective students and faculty around the campus and discuss chiropractic’s philosophy and role in modern health care. During his clinical experience at Palmer, Dr. O’Donovan, DC treated a broad array of patients, including seasoned athletes, weekend warriors, infants and everyone in between. Upon graduation, he received Palmer’s Clinical Excellence Award, an award presented to an individual who best exemplifies outstanding clinical knowledge and skill, leadership ability and dedication to patient care. Dr. O’Donovan, DC is a member of the American Chiropractic Association and the Florida Chiropractic Association. 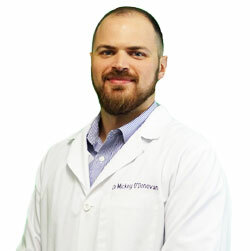 Dr. O’Donovan, DC prides himself on being a devoted family man and enjoys spending his spare time with his wife Danielle, their bright and beautiful daughter Nora and dog Fozzie. The family enjoys spending time out and about in the community, and taking trips to the beach and the aquarium. If you’re wondering how Dr. O’Donovan, DC can help you feel better, contact us today.